Werkshack is please to present: Homesick, by Francis Baker, a visual meditation inspired by inequality in our society manifesting itself as homelessness. 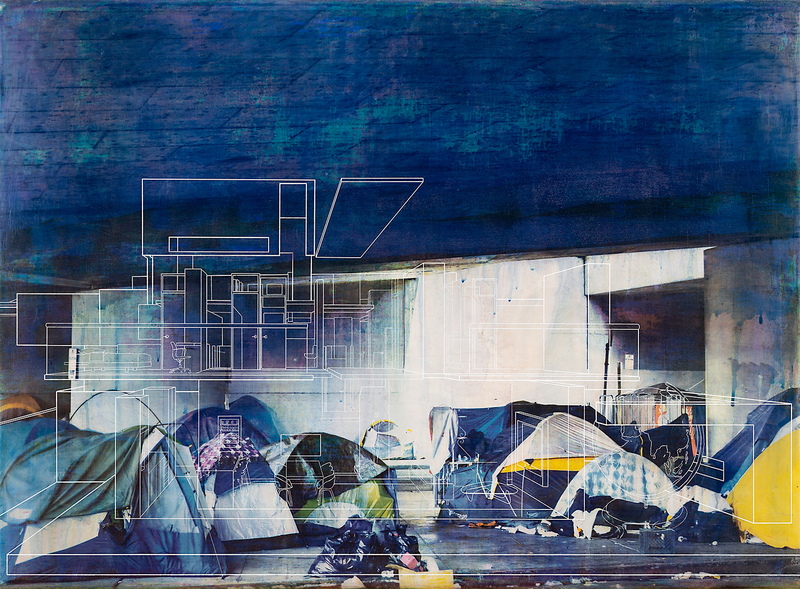 In these works, the privilege / poverty imbalance collapses into one picture plane as engravings of home are mixed with the realities of our homeless neighbors. They evoke feelings of something lost, something not quite attained, the desire to create or recreate some amorphous idea that we call home. For 20 years, Baker has been perfecting the art of photography, 19th century processes and modern photographic output. After thoughtfully capturing digital images, he employs a handmade, mostly analog method of printing with watercolor pigments and gum bichromate photographic emulsion. The image is printed on traditionally a gessoed panel, with rabbit skin glue and marble dust. He scratches and engraves on the final layer to further explore his vision with drawing. The result is a elaborately made, unique piece of art. An expert in photographic techniques of the past and present, Francis Baker explores themes of identity, the home, and human nature in regards to materialism and desire. He is deeply concerned with social patterns of injustice. The material, object quality of the photograph, and photographic processes are significant aspects of his work. He was recently accepted to the Mill Valley Image Flow Gallery Residency, where he will further explore architecture and inequality.